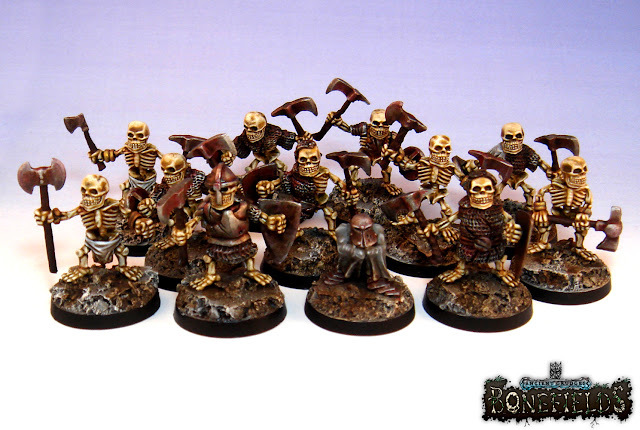 I've just finished off the latest dead lads for the dwarf and goblin warbands for Bonefields, two more slayers and three goblin spearmen. As has been pointed out, the way I've painted the slayer's loincloth makes it look like saggy soiled underpants, which after I finished laughing about I decided only added to the undead horror. Truly a fate worse than death. So it's four spearmen, four archers and the goblin vampire. 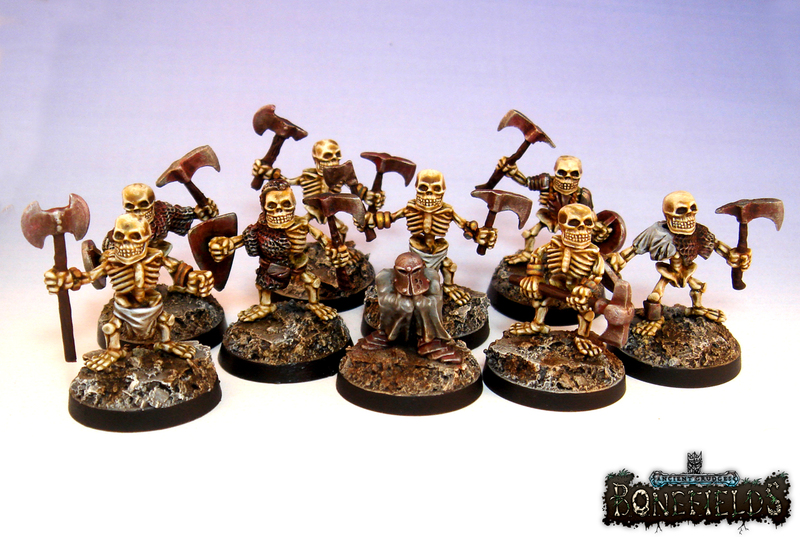 There is an insane amount of units you can add to this starting warband. 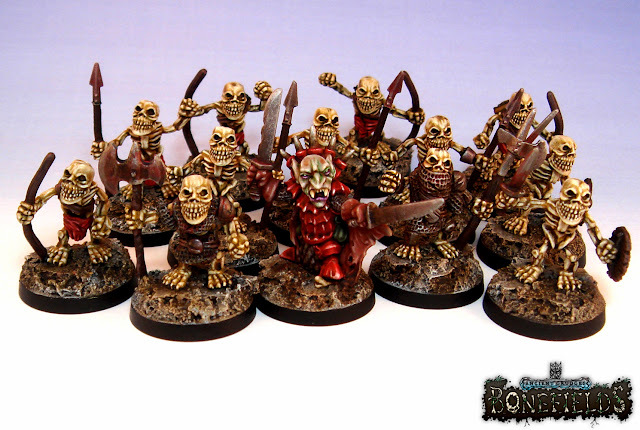 I hear tell of undead Squi- ah, I mean rotund cave dwelling monsters, cavalry, command models and even war machines. The sculptors Alessio Cisbani and Darren Edwards are doing mighty work indeed, along with the indefatigable Chris Nicholls, owner of Macrocosm and creator of Bonefields. As to the dwarves, here's the warband as it stands. The dwarf necromancer controls a dwarf hero, two dwarf wights, four slayers, (two with greatweapons and two with two axes) and four warriors with sword and shield. 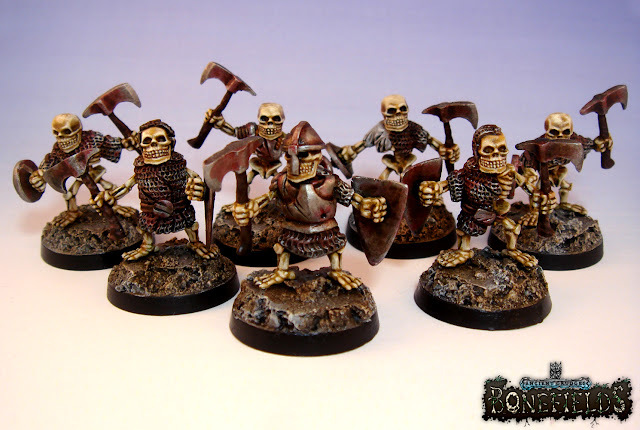 For the dwarf side of the starter set you get four warriors, four slayers and the dwarf Necromancer. All told the set contains eighteen miniatures at the time of writing. 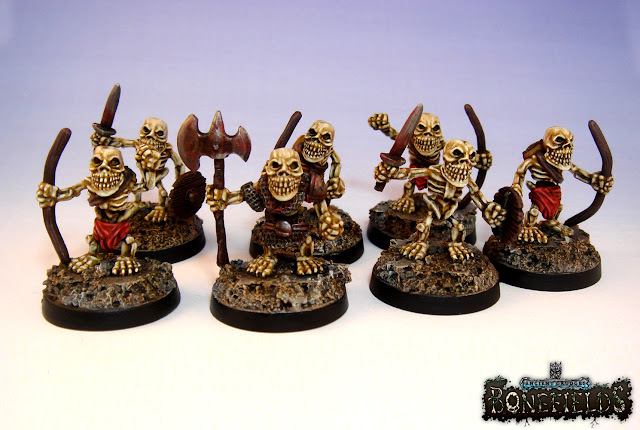 The dwarves are likewise set to receive a load of models to expand the warband. Cavalry, zombies, crossbowmen, command and even artillery. 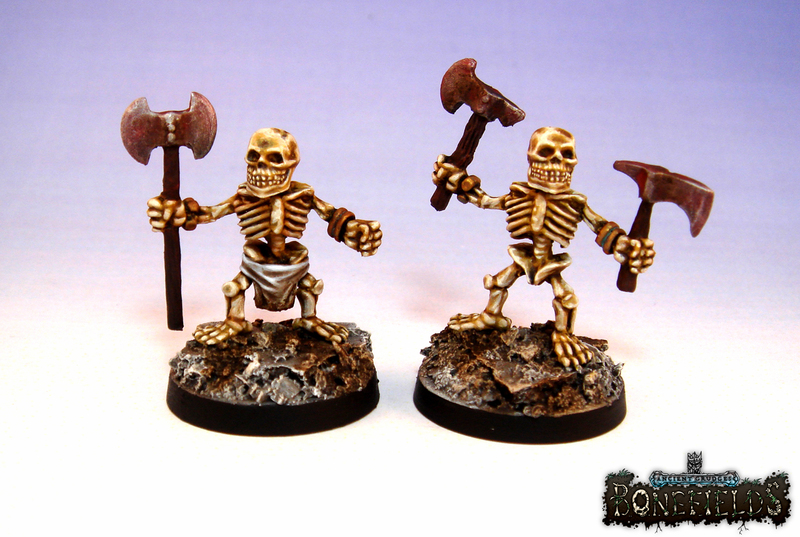 I have two more undead on the table at the moment which I'll be using to build a painting tutorial for techniques used on the models seen above. One is another goblin heavy infantryman for rusted and worn armour and the other, the bone tutorial, is fanatical about his ball and chain. The Bonefields Kickstarter kicks off on the 23rd of February. Following on from my earlier post on Macrocosm's upcoming Bonefields release, I've been beavering away on some more of the new range. First up is this fantastic goblin vampire. I don't recall ever seeing a goblin vampire before (gobpire? Vamplin?) but Alessio Cisbani has done a fantastic job on this evil wee spud. I'd love to see him do other types of goblin vampires. I moved away from the traditional goblinoid green for his flesh to up the vampireosity, just adding some green glazes to his eyes and other facial recesses. 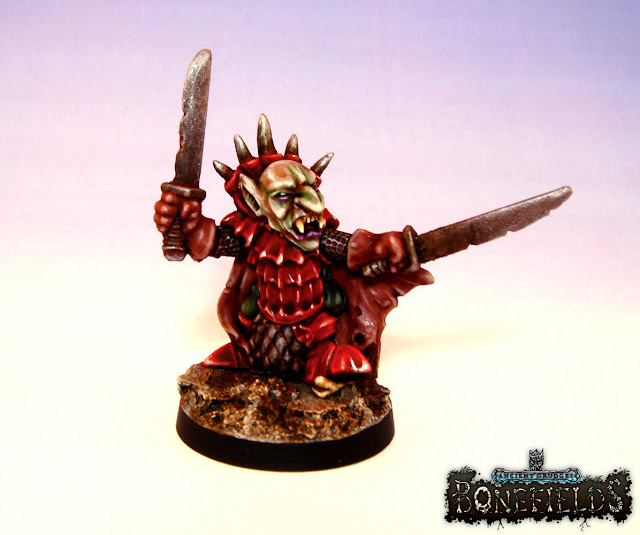 I painted him in fancy lacquered red armour, but, as he IS a goblin after all, it's dirty and knackered looking. Two rusty swords complete to look for this diminutive blood-drinking nutter. I've also completed two more goblin undead, a spearman and one of the goblin heavy infantry. 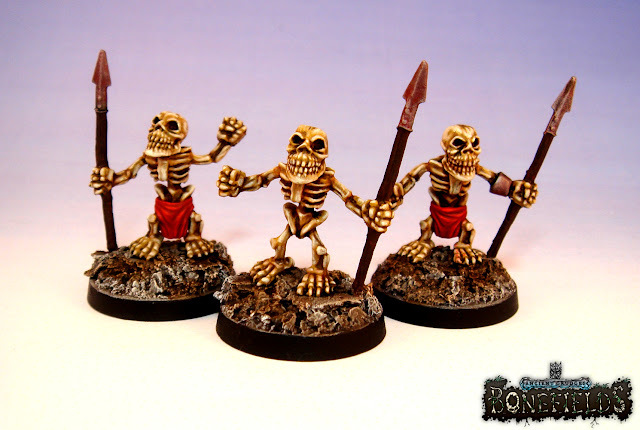 As with the other goblin skeletons they paint up nice and easy. 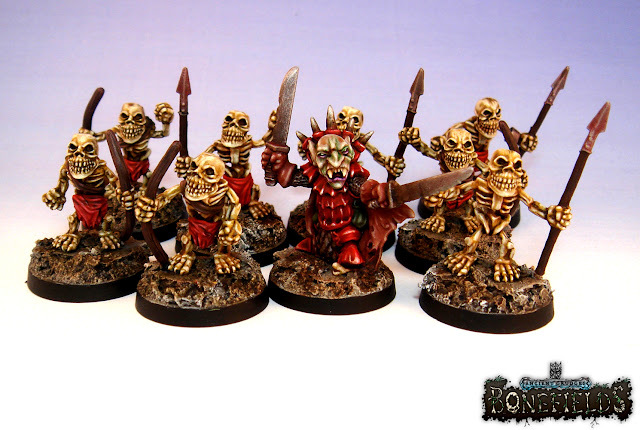 I have some of the more exotic goblin undead on the table at the moment, but that's for another post. 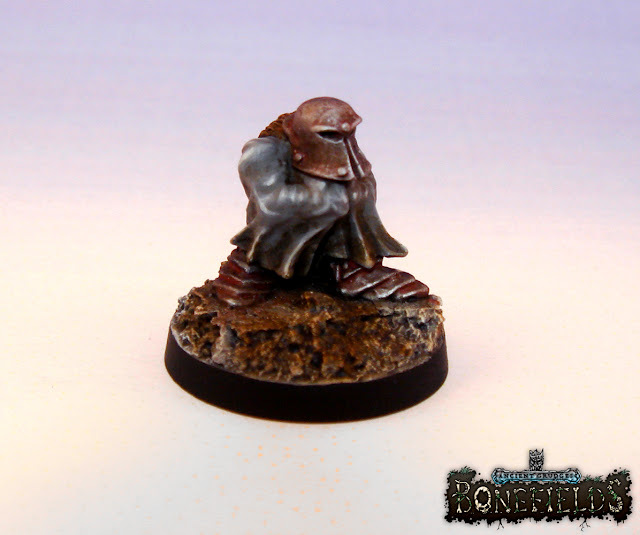 Next up we have the wizened little dwarf Necromancer. He's all feet and head this lad, and has a scuttling sneaky pose that's distinctly un-dwarfy. Flanking our creepy wee necromancer we have two of the new undead dwarf slayers/berserkers. They still have their golden arm clasps, but those luxurious beards are gone forever. Truly a fate worse than death for a dwarf. They must be mad as hell. I have another batch of Bonefields minis on the painting table at the moment. Once they are done it'll be time for some warband photos. 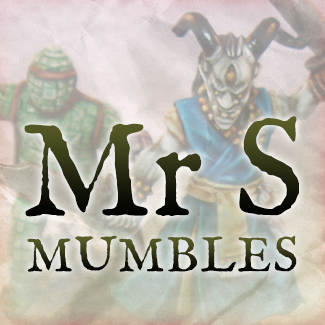 There are some truly hilarious models in the pipeline, I can't wait to get to some of the more unusual undead, they'll be a lot of fun to get on the gaming table. 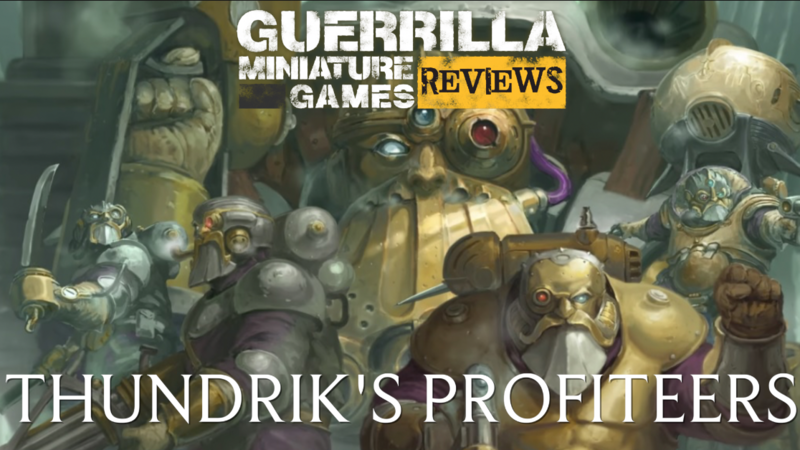 It's that time of year again, time to glance back over the last 12 months and see what I've done in the hobby. It's been an extraordinarily intermittent year, veering between hot hobby flushes with wondrous gooey mojo in abundance to nihilistic hobby desolation where brushes sat untouched and unloved for weeks on end. You ready? Let's kick off so. 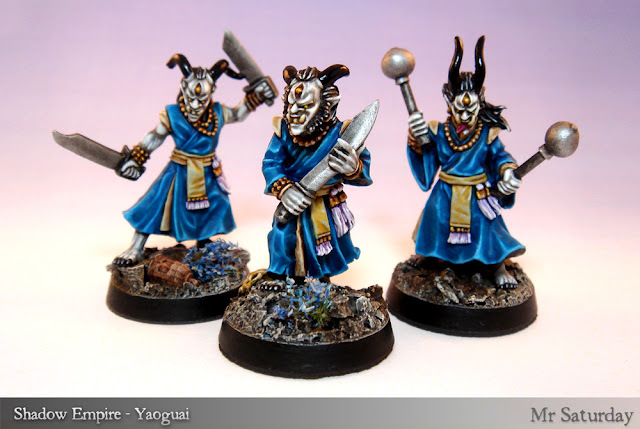 I started off the year with three Chinese Yaoguai for my Shadow Empire army for Dragon Rampant. I'm super happy with these guys. I chose quite saturated colours to make them stand out against the rather monotone terracotta warriors. One thing I was quite chuffed with was how adding metallic silver to the sash highlights gave them a pleasant sheen that mimicked silk rather nicely. 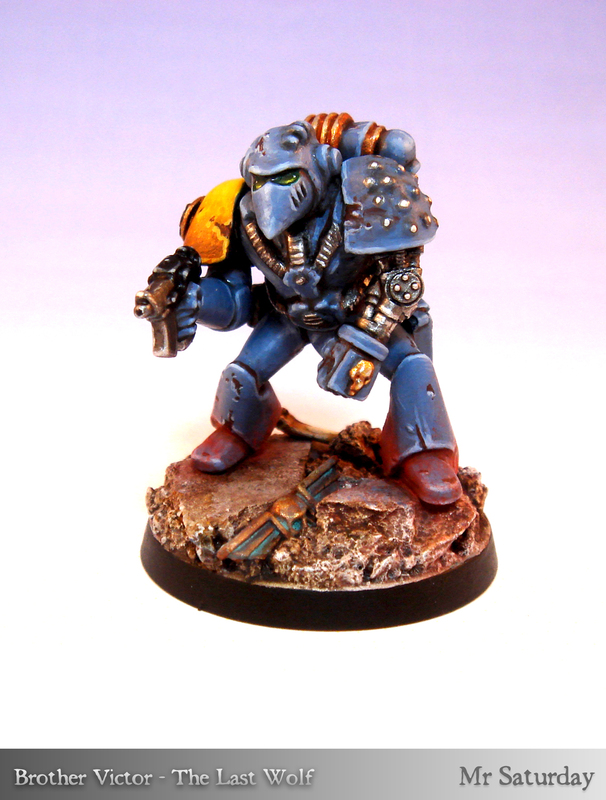 This guy was probably my favourite mini of the year, the lost and found again brother Victor. Rescued from a terrible fate, stripped, whittled, repaired and rebuilt, he was a fun project. This was also the first model I used weathering powder on. He looks hilariously tiny now, compared to the Primaris marines (Which I like too ) though the scale discrepancy bothers me not so much. I wonder when someone will convert a squad of beakies to ride primaris into battle? This fellow however marks the last mini I would paint for some time. But when I did come back to painting, this lad was waiting for me! Lo Pan, the leader of the Shadow Empire and a bucket list character I've wanted to paint for years. I completed him toward the end of March, finishing my command unit for Dragon Rampant. Still basking in the post finished unit glow, I took a sharp about face and headed North, into the wastes. Actually, that's not right, is it? 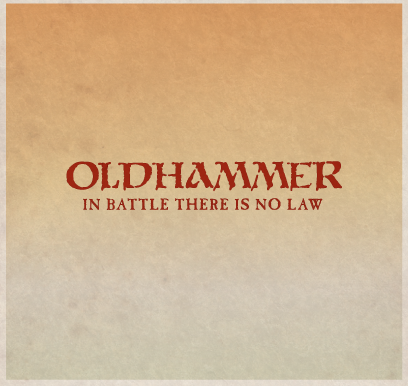 Chaos doesn't live in the North anymore, does it? It's bloody everywhere in AoS. Under the bed: chaos. In the sports section: chaos Khorne team wins county cup. On the way to work: Nurgle salaryman lets one rip in packed tube with THAT smile on his face. Knock on the door: Two incredibly well dressed lads ask have you heard of lord Tzeentch? No? Excellent, that's because he's so sneaky. Welcome to the fold. Here's your suit. No sign of Slaanesh though. Maybe I should check under the bed again. Well, anyhow, I was quite taken with Gorechosen, so I decided to paint up a gladiator, the not over the top at all slaughterpriest, Markus Scissorfist. 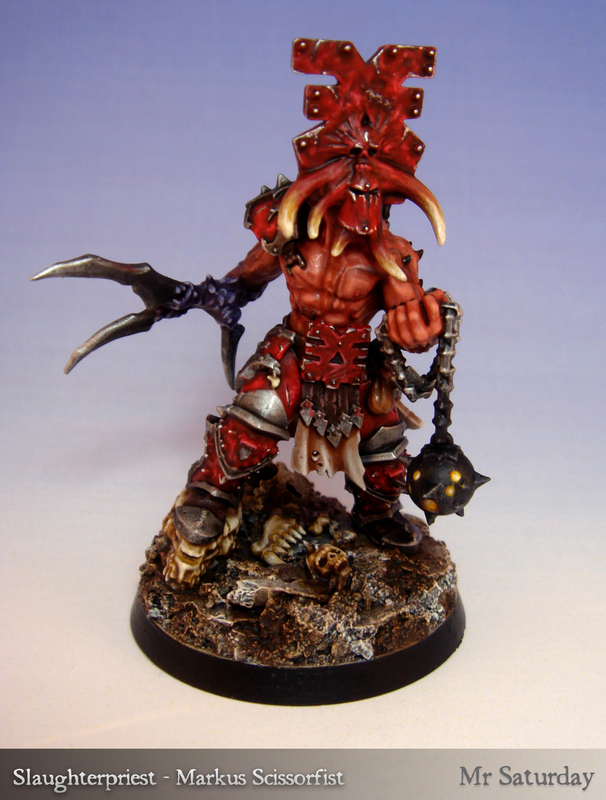 He's quite big, twice the height of a Realm of Chaos thug, but y'know, it's chaos, so feck it. I also swapped his head out for a UGE mutated helmet. I figure if I'm gonna go Khorne, I may as well go full Khorne. After this dainty flower was finished I headed back to the Shadow Empire. We were in June now. These odd gents are guardians, as seen in Big Trouble in Little China. 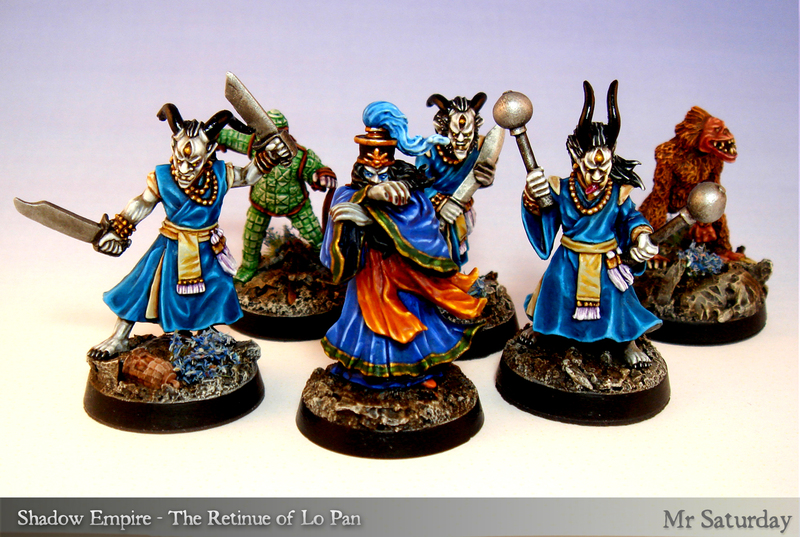 I figured Thousands of years ago Lo Pan might have has a few more, so I made a unit for the army. Fun little spuds to paint. This was my last addition to the army for the year, though I have many additions planned. Bronze cavalry ridden by terracotta warriors, the three storms, Chinese vampires, a war chariot, even undead snakemen, the sculptors of the warriors. 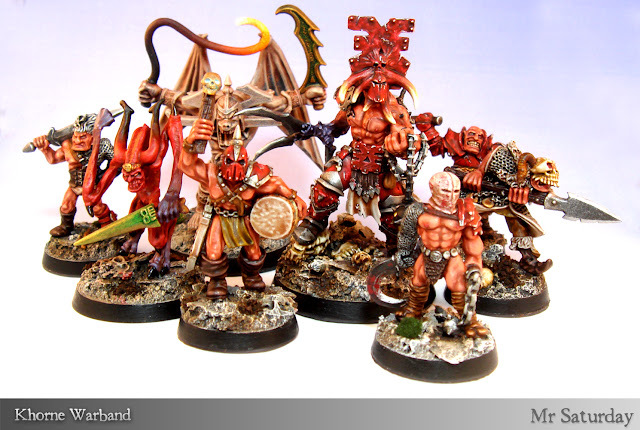 I spent the rest of the Summer slowly adding to my Khorne warband, which I enjoyed very much indeed. I was light on hobby for most of the Summer, but adding a model to the band here and there kept me in the game. I love the old thugs, and I hope to add quite a few more. 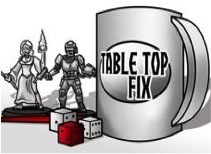 Ultimately it would be nice to have a force to play larger games of AoS or Dragon Rampant with. 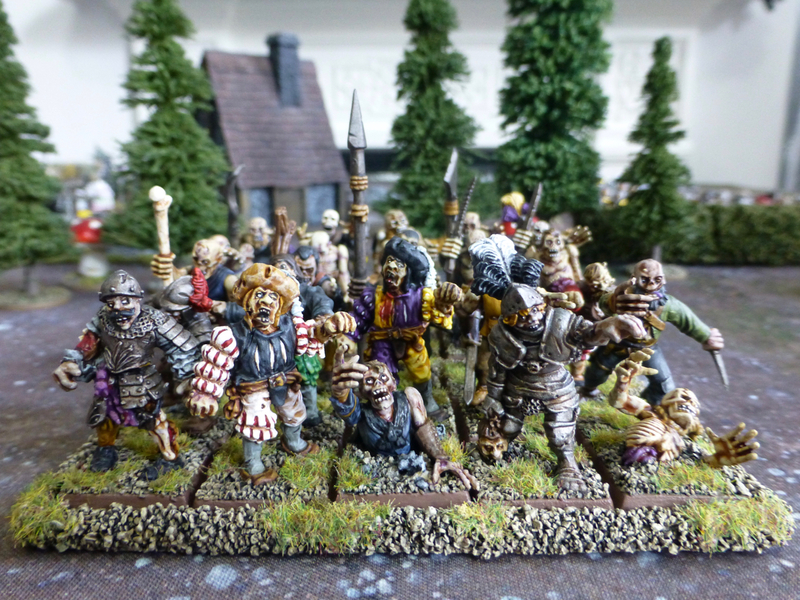 As we wore into Autumn I learned that Essex miniatures had a hearty trove of Bob Olley minis in their ranges, including undead. 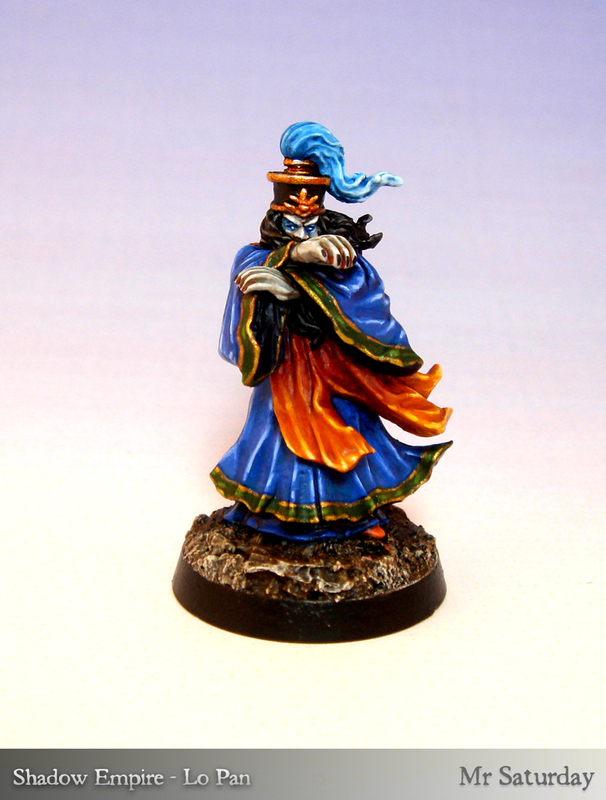 This guy was sent to me by a kindly soul on the proviso I paint him up post haste. 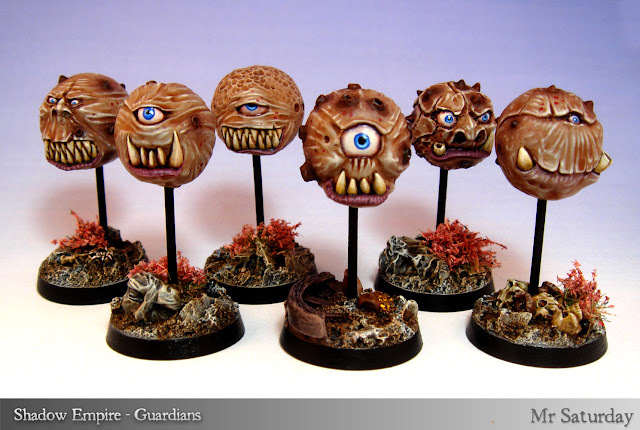 Now, anyone who has painted an Olley and not just drybrushed the whole thing knows there are place an Olley sculpt can take you you may not return from. Folds within folds, time and space cease to follow the laws of the universe, everything you know is called into question. This was most definitely the wrinkliest Olley I've painted. You'll never be the same, but damn they are satisfying models to paint. Around this time I had a friend calling down once a week for games. 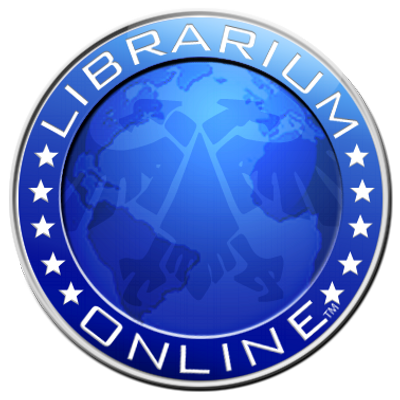 It was a most welcome weekly event, as otherwise my gaming has been most poor in 2017. 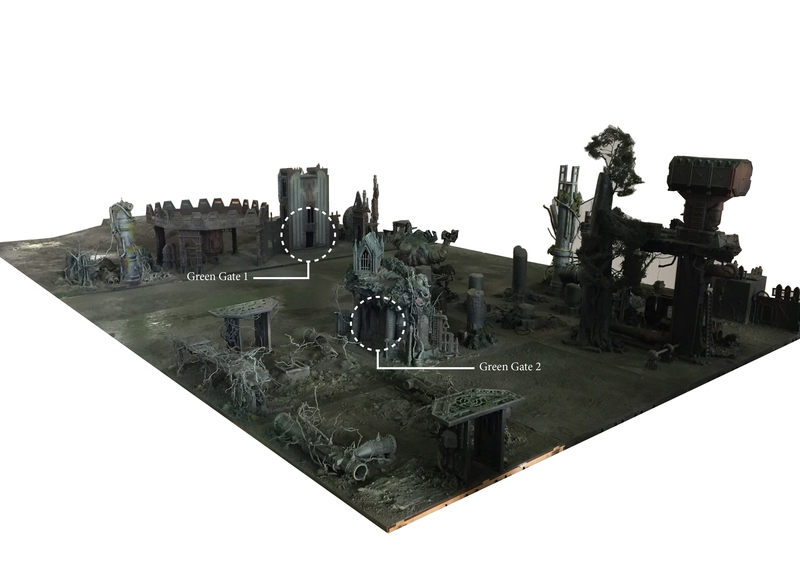 I tend to play in other places apart from at home, often on tables with spectacular terrain, so my home terrain set is starting to show some deficiencies. I took to touching up some of my terrain boards, and then my eye lit on this tower which has been sitting in a closet for a decade or more. 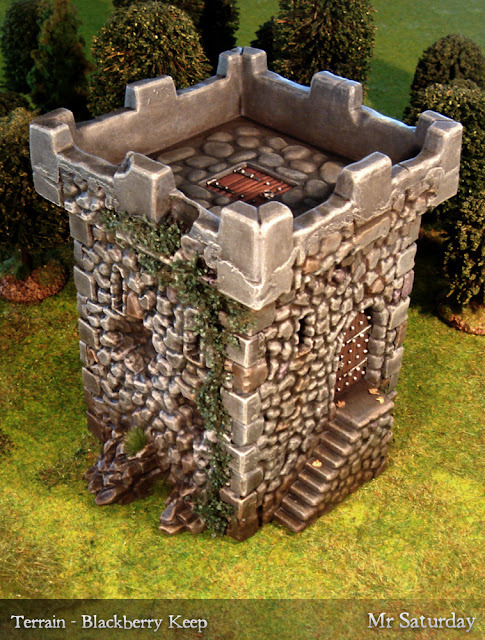 It took very little time to update this old Battlemasters tower, and it's a grand piece to have in the collection. Gawd bless Typhus Corrosion. 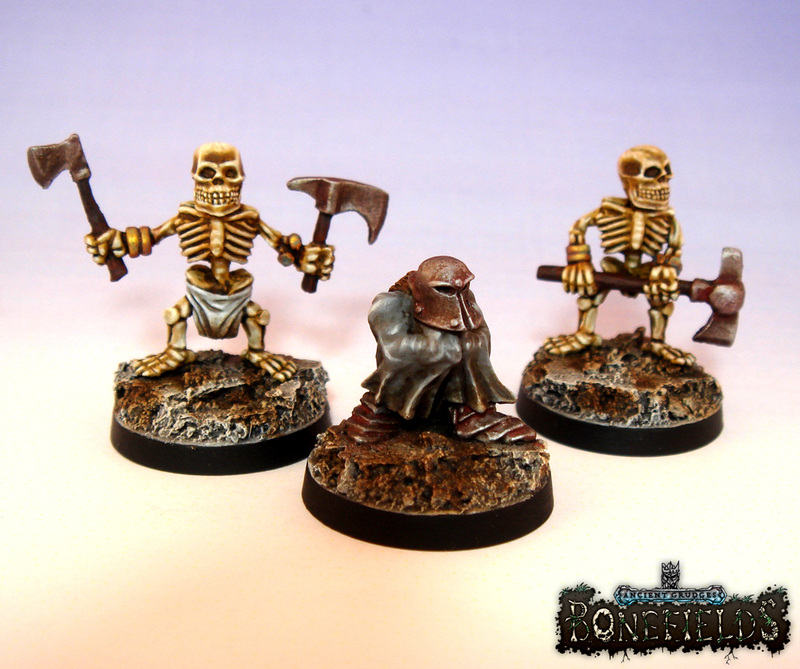 As Winter closed in I started working on some minis for Macrocosm's Bonefields project, starting with undead dwarves and goblins. It's very fun, and I've got another pile on the painting desk at this very moment. There's something very tongue in cheek about the range I really like, and I now want to see all sorts of fantasy stalwarts undeadified. The Kickstarter begins toward the end of February if I am correct. As the year wound up I found myself in possesion of this fine fellow, sent on by Ross of Krakon Games. Conand here was part of the Wrath of Cichol Kickstarter, and as even the dogs in the street know, I'm very keen on the fimir, or in this case, fomorians. 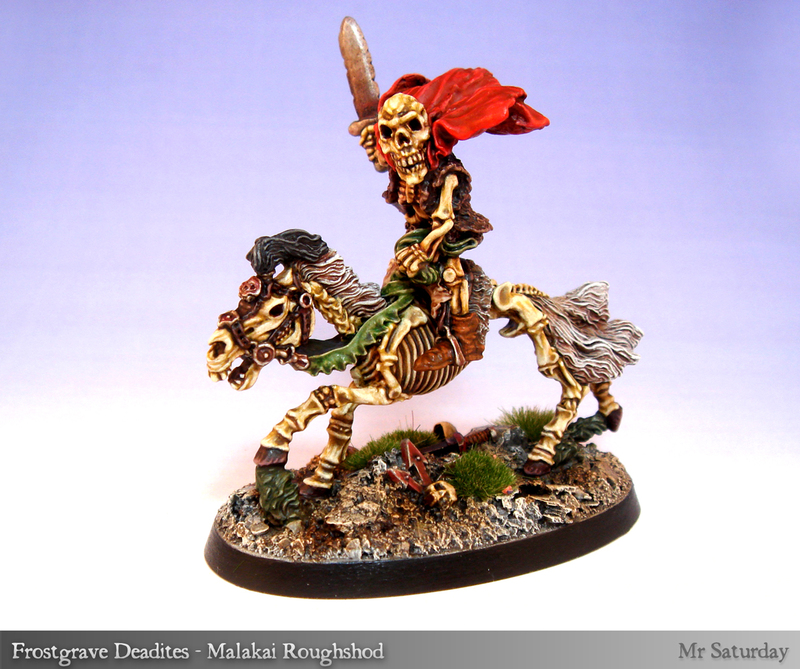 It was very pleasant indeed to work on this guy, and gave me a grá to work on more fimir. I refined my fimir palette a little for him, and I'm liking the result. 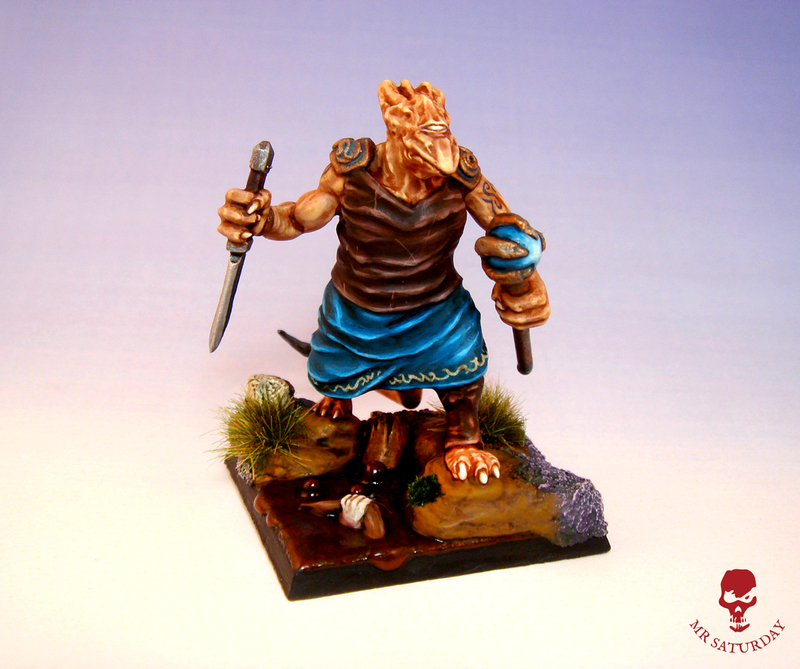 I have several other fimir-like minis on the painting desk at the moment, many from Bloodmoon Miniatures, which I should have finished months ago. Finally, just before Christmas I cracked out this tiny fellow. He joins my chaos Santa, and over the years I'll add a few more Christmas themed minis. I already have evil elves and the Krampus lined up for next year. 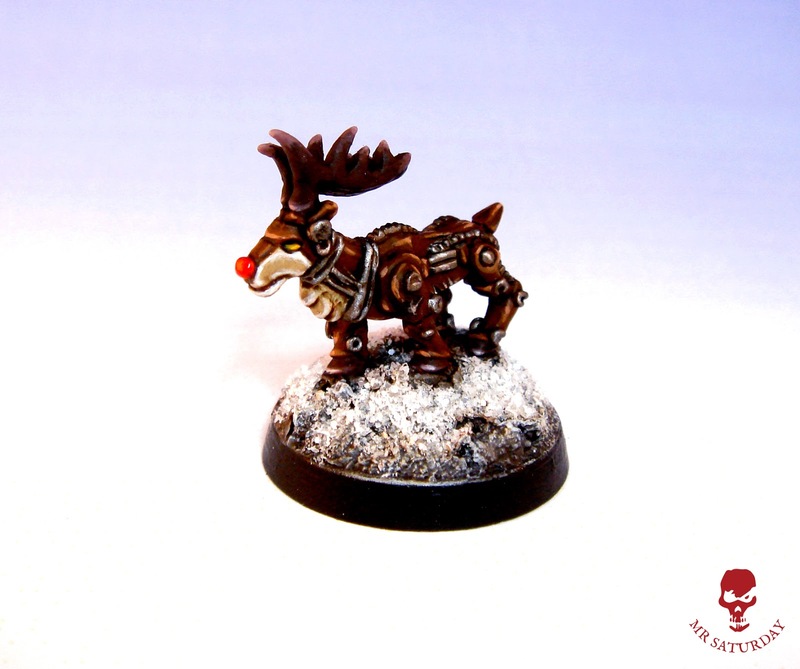 Who knows, in time I might have a Christmas warband. So a fairly lean year, productivity wise, with less than forty minis painted. On the plus side, I already have the first ten minis or 2018 almost finished, which puts me well ahead of the curve on 2017. As always I have plenty of ideas for what I'd like to work on this year. A force or terminators from 2000AD's Nemesis is high on the agenda right now, as are several other ideas, so we'll see, you know how these things go. For the first while though it's all undead flavoured, with a light fimir seasoning.